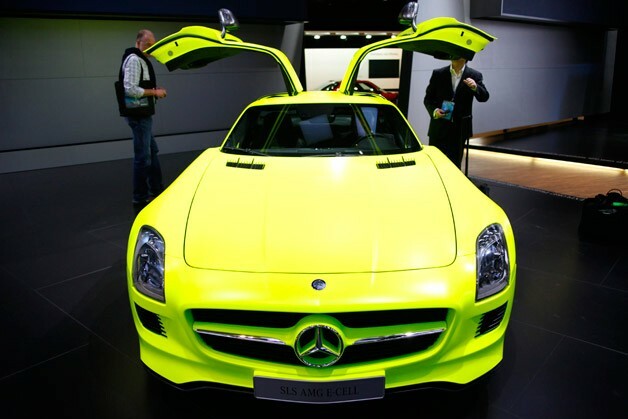 Mercedes will begin taking orders for the SLS AMG E-Cell towards the middle of 2012, with test drives and deliveries slated to begin late next year and in early 2013. Ola Källenius, Chairman of the Board of Management at Mercedes-Benz AMG, says development of the all-wheel-drive, all-electric supercar is moving along at a brisk pace, although official specs, range and curb weight haven't been firmed up just yet. However, Källenius is confident that despite the additional weight of the lithium-ion battery packs occupying the torque tube tunnel, performance will be exceptional, particularly with AMG's ability to independently control torque output to each wheel via the four electric motors. But the SLS AMG E-Cell is only the first step – even though it's a massive leap forward for the brand. Electric drivetrains and implementing some sort of a Kinetic Energy Recovery System (KERS) will be part of AMG products in the future, although Källenius won't commit to saying which models would benefit from the technology. "We must look at everything," Källenius told Autoblog, and utilizing alternative powertrains in the pursuit of ultimate performance will be key to AMG's tire-shredding efforts in the future.